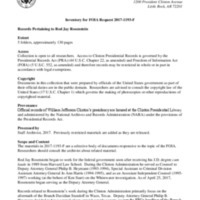 This collection consists of material relating to Rod J. Rosenstein, who President Trump nominated to be Deputy Attorney General for the U.S. Department of Justice in January 2017. It contains correspondence, reports, faxes, court orders and motions, and emails. During the Clinton administration Rosenstein served as Counsel to Deputy Attorney General Philip Heymann from 1993-1994.